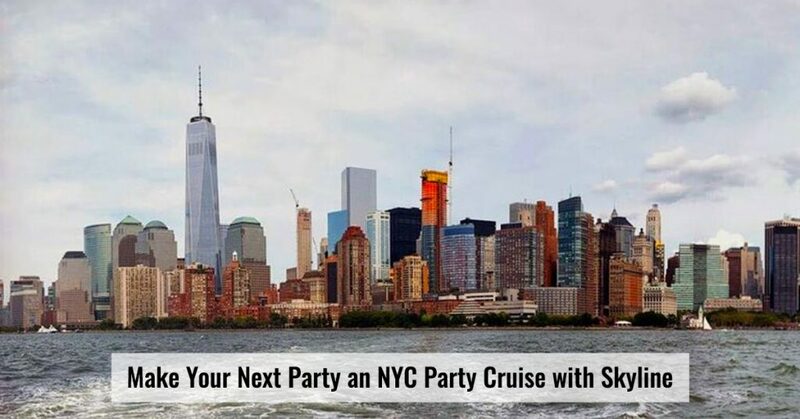 Summertime is the perfect time for a party and there’s no better venue for your NYC Party Cruise than with Skyline Cruises. Our 3-deck luxury ship the Skyline Princess can take you to some of the most iconic sites in the greatest city in the world. If you’re planning a party or event of any type, you can make it an event you’ll always remember with Skyline. We’ve been making memories since 1993. Let us tell you why we’re New York’s best party boat. You’ll get an up close and unique look at the greatest city in the world, and we’ll also help you through a great party. We can help you host parties and celebrations of every type. You name it, we’ve done it. We host corporate events of all types. You can entertain clients, hold your business meeting, host a morale building or networking event or celebrate a retirement. We recommend that you hold corporate parties on weekdays or weeknights. We’re also the go-to venue for personal celebrations like Bar/Bat Mitzvahs, Quinceañaras or any type of birthday party. We can host your anniversary party, graduation celebrations, fundraisers and events for private organizations. And the Skyline Princess is the ideal venue for your wedding. We can arrange the nuptials you’ve dreamed of from a large formal banquet to a modern cocktail party. We often hold onboard ceremonies presided over by our dear friend Captain Arnold. Whatever type of party you’re planning, we can accommodate groups large and small and we’re used to working with all types of budgets. We can offer a full ship charter. The Skyline Princess is Coast Guard-certified to accommodate up to 450 people. Or you can reserve a full deck on one of our public dinner cruises. If you have a smaller party plan, we can reserve a few tables for you. Even one table. Our vessel can be chartered with a variety of food options. As mentioned above we can cater for you, you can bring your own caterer, or you can keep it simple with no food service at all. We also have a large dance floor on the third deck of the Skyline Princess. The top deck has a DJ space and can be opened or fully enclosed. Your party will come off as scheduled because Skyline cruises all year round. Whatever you have in mind for your party, let us know. We’ll work with you to make your dreams a reality. And we’ll work hard to help you plan lots of fun. All of our public NYC Lunch, Brunch and Dinner Cruises sail from the Worlds Fair Marina in Queens. Our private full ship yacht charters sail from many ports in NY, NJ, LI, Westchester and Connecticut. Contact us today.